I myself would totally buy the Spiteful Breakvan in HO scale. I have a lot of custom troublesome trucks with different faces and I think that this would finish that train off perfectly. I did make a custom breakvan with some modifications. I started with a Henrietta and a standard breakvan. I took the top of Henrietta off and used the top of the breakvan shell and placed it on top. With some cutting of the plastic on the base I was able to fit the shell on perfectly. I will post pictures soon. A different style of breakvan would be a nice addition. I may be in the minority here, but I do see Bachmann taking a year off to revamp part of the HO range, meaning new drive units and updated CGI faces on the engines. I know a lot of people want the classic season faces, but with the many years of production models, I am sure that people would still be able to find the old ones with no problem. In all honesty, the only ones I see them changing the faces on are the main 7. The reason I say this is because every other range has been changed to show CGI faces, aside from A&C and TT's keeping the original faces. Now you could argue that it is easier for Wooden Railway or Take Along/Adventures to make this change with all of their line up, and I would agree with that. But with the Bachmann models, all that would really have to be done is for new face molds to be made to fit the existing eye mechanism. I have seen many people do this with the Wooden Railway faces but you loose the moving eyes, and I have seen some Shapeways 3D printed faces but they still need to be painted and drill the eyes out. I also can see upgraded drive units, or as I should say, what happened to Thomas about 2 years ago. Make them easier to assemble, have less wiring to the motor and perhaps improve pulling power. I see this happening sooner, rather than later. Either next year or even the year after that. With the rumored James repaint still not officially announced, I can see them doing this slight upgrade to all of the engines that still have gray parts that should be black and/or paint changes. They did it with the latest Thomas models so I don't see how big of an issue that would be. I know someone is gonna say "You can paint it yourself", but the little upgrades that would just mean replacing the gray paint with black, or the gray plastic mold with black at the factory seems easy. It has been proven with the Sound Thomas, looks like the same exact mold with a different inside and black parts. The same black upgrades that are needed on the main 7 excluding Edward. Only addition to the tender engine would be the wheels on the tenders. what do you mean by A&C and TT's? Annie and Clarabel, Troublesome Trucks. Making the Spiteful Breakvan yourself is really not hard either. A couple pages back, an admin pointed out that it's the licensor who decides what a product has when it comes to production. If Bachmann made unauthorized changes, that would result in legal troubles, and we don't want that. But the consumers modelling is okay. Just wanted to make it clear. You're missing the point of my post. Sure it's a simple piece of stock anyone themselves could make, but when you consider that it's being made in large scale and not HO it just doesn't add up, especially when it's guaranteed to be more popular in HO. Apart from this little comment, I'm glad to see that everyone else agrees that a spiteful brake van in HO would be a good idea. Fingers crossed Bachmann can follow through with this. The point of my post was not Bachmann doing the changes themselves. All other brands are switching to CGI faces because Mattel are telling them to. Bachmann does have a say to a point, remember what happened to Duck? Bachmann decided to change the black running board to white because of the fans. Yes they probably still had to go through Mattel to get it okay'ed but same reasoning applies. Mattel would want to keep products looking as close to the current seasons as possible. I would be interested to know if the CGI changes that happened to the tankers and mail cars happened because Mattel/Hit told them to, or if it was their choice. For Mattel telling or allowing Bachmann to make the Spiteful Breakvan in G gauge is a good sign that it will come in HO at some point. Just look at the G gauge vans that came out, took a year for them to then come out in HO. I feel the same will happen in 2018. I know I have gone into detail earlier in regards to my thoughts on next year for narrow gauge as well as the spiteful brake van in HO. But as far as an actual "list" goes then here is what I personally expect for next year's announcements. Sidney/no engine - IF they do an engine next year, then I can only see them doing Sidney since there's no reason for Bachmann to invest in a new tooling engine-wise at this point considering the recent track record of production for HO engines. However, with that in consideration and Sidney's lack of popularity, I wouldn't be surprised if Bachmann skipped making an engine in HO altogether. Spiteful brake van - I've explained in detail why I think this should happen but I still think it's a good possibility considering how some of the vans in large scale made their way in the HO range as Rickenbacker mentioned earlier, (even though the van toolings are different). 2-3 random recolors no one expected (or wanted) - Let's be honest aside from Toad and Troublesome Truck #5 that's all we have been getting for HO rolling stock for the last couple of years, and I don't expect anything different in the future. Sir Handel and/or Peter Sam - It seems likely that either of these two have a chance and I think Bachmann should still invest in both to give HO a break from making an engine as well as filling the gap between Rheneas and Rusty. If they had to choose just one engine though, I think Peter Sam has a better chance since he has had better luck with merchandise than Sir Handel, or Duncan for that matter. Stone wagons - While I prefer coaches and think they would be better sellers, I think because of the emphasis in both the show as well as Bachmann themselves on mining for the Skarloey Railway that they would be more inclined to release some new quarry wagons. I would bet on 2 or 3 of these wagons with stone loads in each of them. Narrow gauge Brake van - With all the freight rolling stock that has been coming out, a brake van for the narrow gauge range is long overdue. 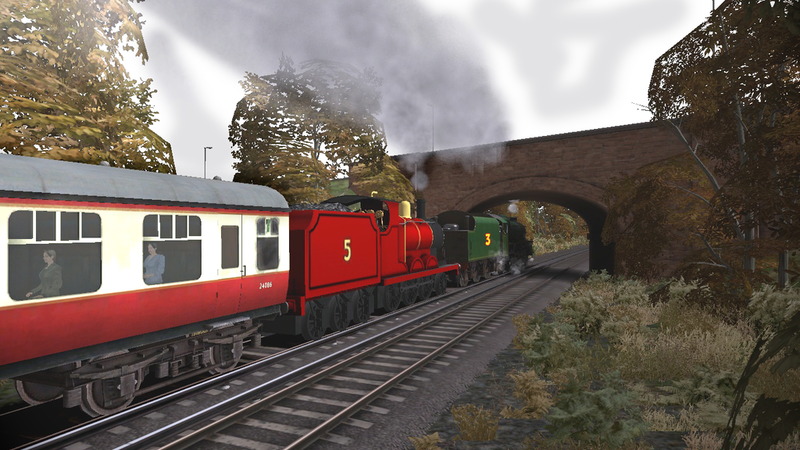 Just making one with the wagons would make up for the lack of narrow gauge rolling stock that got announced this year. 'Arry and Bert - It's obvious. There is no reason at all not to expect these two to happen. Considering how minimal the large scale announcements in recent years, I honestly wouldn't be surprised if they were the only things to get announced next year for large scale. I really think that listening to suggestions that won't fit the current pattern of how Bachmann releases their Thomas models is getting very tiresome, as Bachmann ONLY make the TV Series characters, now only the CGI characters, non of the Railway Series characters that aren't in the show right now are going to show up. Honestly, unless Bachmann make the tooling for Norman, Den, Dart, Samson, Portor, Timothy, Connor, Caitlin, Hiro, or Hugo then they'll only announce Sidney next for HO. but Rex, Mike, & Bert are in the show. Could they ever make Bill and Ben in G-Scale? They would make a good addition to the G-Scale range. 2 engines for the price of one molding. Same with Donald and Douglas. As I said earlier I think 'Arry and Bert will probably be next, but if they were to go with a new tooling, I would bet on Mavis or Bill and Ben. Donald and Douglas, (and Duck as mentioned in another thread), would be too big for large scale.